Staff Selection Commission has recently conducted a recruitment examination of CPO SI on 23rd June 2013. This SSC CPO SI examination was conducted for the post of Sub Inspector in Delhi Police (DP) & CAPFs/Assistant Sub Inspector in CISF and Intelligence officer in NCB. 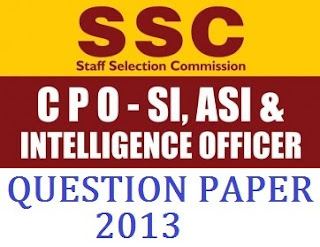 SSC CPO SI 2013 examination was conducted for the total 2240 vacancies for the post of Sub-Inspector in Delhi Police (330 posts), Sub-Inspector in CAPFs (734 posts), & for Assistant Sub-Inspector in CISF (1176 posts).You can download question paper from here. This SSC CPO SI answer Key will be utilized & also will be helpful for the candidates in comparing their answers to get the approximation score in SSC CPO SI examination 2013. SSC CPO SI 2013 Answer Key is very important thing for the candidates who appeared for the SSC CPO SI 2013 exam. This answer key will be very helpful for the candidates to know their actual performance in SSC CPO SI examination in June 2013. You can download answer key from here.